WHEN A TERRIBLE FIGHT JUST MIGHT BE THE END? Making up is hard to do. When young dinosaur friends have a fuss, it can be a beaut! DOES HE WRITE ON THE BLACKBOARD A VERY BAD NAME? DOES HE TELL ALL THE KIDS THAT HIS FRIEND IS TO BLAME? Even the best of friends can get into a disagreement that can turn ugly. When he's angry, a dinosaur may do outrageously shocking things--tearing up his friend's book, throwing his lunchbox in the pond, even egging his door to settle the score. Is this the way to keep a friend? 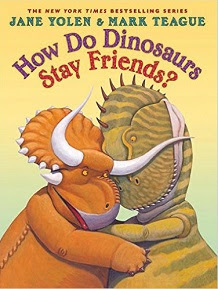 All friends fall out of friendship with each other from time to time, but Jane Yolen's latest in series, How Do Dinosaurs Stay Friends? (Blue Sky Press, 2016), takes on the tasking of making up after breaking up. HE SENDS A NICE NOTE TAKING MOST OF THE BLAME. HE'S SURPRISED WHEN HE FINDS THAT HIS FRIEND DID THE SAME. Yolen's friendly rhyming couplets portray the ways youngsters can make peace after a squabble--sharing a new toy at a special playdate, making and taking homemade cookies over on a plate, all the ways of saying "Can't we still be friends?" As always in this popular series, Yolen's text and Mark Teague's super-sized illustrations provide the ying and yang of the situation, first the worst alternatives, followed by the preferred examples, done up in Teague's comic style, a spoonful of sugar that takes the sting out of the proffered how-tos of personal life. Making making up a bit easier is the premise of the latest Yolen and Teague collaboration, and as is their custom, Yolen and and Teague offer esoteric examples of dinosaurs, identified on each page and reproduced on the eye-catching endpapers for dino afficionados. Pair this latest with Yolen's and Teague's recent in their dynamite How Do Dinosaurs series, How Do Dinosaurs Stay Safe? (Blue Sky Press, 2015).